I’ve got your lunches covered for this #Veganuary. 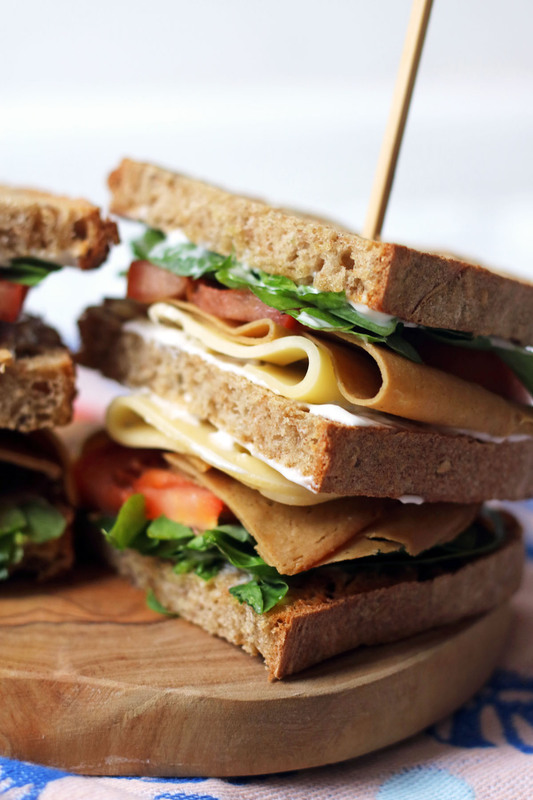 Check out my recipes for the Ultimate Vegan Club Sandwich. What makes a sandwich a “club” sandwich? White bread is also a key element, toasted for extra crunch. I’ve heard that a club sandwich isn’t a club sandwich unless its so tall it’s physically impossible to take a bite out of! Now that might seem a little extreme but I do like my sandwiches chunky. An extra slice of bread in the middle helps make this sandwich tall and provide a bit more structural support for all of the fillings. So if we’re making this sandwich vegan we can’t possibly be using sliced chicken or turkey. Quorn do a range of sandwich fillings including vegan chicken free slices. They’re the kind of product I’ll buy if they are on offer but they don’t set my heart on fire. In terms of flavour they are very basic and play a supporting role rather than being the star. In the run up to Christmas I discovered my new favourite sliced meat alternative – hickory smoked deli slices from Tofurky. They have a range of different flavours (including peppered, Italian and roast beef) but the hickory smoked slices are my favourite. They are sweet and savoury with a real smoky flavour imparted by spending time in a smokehouse filled with smoke emanating from slow burning hickory wood chips. The texture is great too. The slices are a good thickness which means even with just one or two slices you get some bite, making them perfect for a hearty club sandwich. The hickory smoke flavour also means you don’t feel like you are missing out on the poultry or bacon in the classic (meaty) club sandwich. Vegan cheese has come on a long way in the last few years and there are some good alternatives out there. Luckily for a club sandwich all we really need is a nice, thin slice of cheese that has a mild, creamy flavour. Enter Violife! Violife have a wide range of different “cheese” products but for this sandwich you will want to buy the cheddar slices. They aren’t too sharp and stand up well against the rest of the sandwich ingredients. If you can only get original flavour then don’t worry, they’ll work well too! Top tip: I’ve seen that Waitrose have reduced the prices of their vegan cheese in the run up to Veganuary so it might be worth stocking up! If you’re making a sandwich with mayonnaise it has got to be Hellmann’s right? Well when I was first looking in to vegan mayo the Hellmann’s brand just didn’t come up. I believe they make a vegan sandwich spread in the US but I haven’t seen one in the UK. If you know where to find it let me know in the comments. There was, however, tonnes of information about how Japanese Kewpie Mayonnaise is a fantastic egg-free mayonnaise. The problem is my local supermarkets don’t sell this either and so although it is delicious, it’s a pain to source. So, what mayonnaise have I been using? 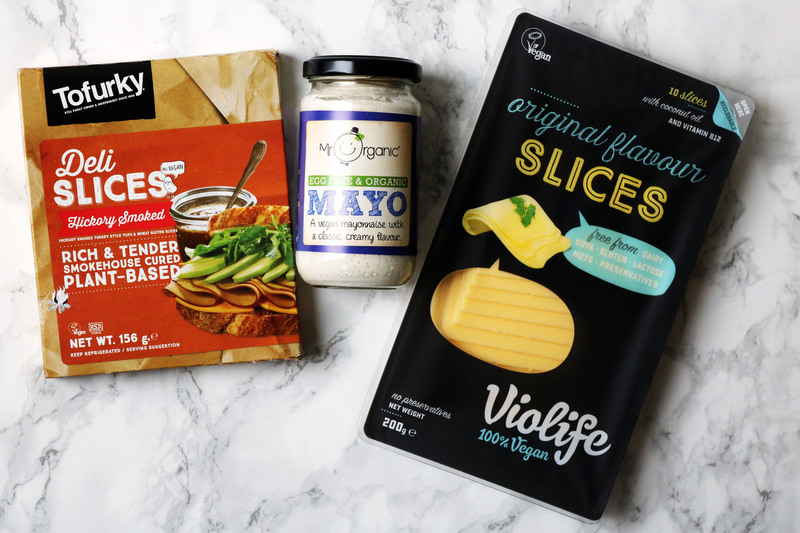 Mr Organic Vegan Mayonnaise, that’s what! I’ve only been able to find it in a small jar (180g) but every supermarket I’ve been to so far has had it in their free-from section. They also do a really good garlic mayo but more about that for another day! I love the consistency of My Organic’s vegan mayo and although its a bright white colour, it tastes pretty similar to the real deal. Once I’d solved the issue of swapping the meat and dairy for tasty vegan alternatives I couldn’t stop there. White bread became sourdough. Iceberg lettuce became baby salad leaves and the tomatoes…well they stayed as tomatoes because there’s nothing wrong with them. All in all this is a pretty hefty sandwich, but if you want to enjoy it the real “American way” then you’ll want coleslaw or potato salad, maybe even a serving of fries. And don’t forget the dill pickle on top! It’s also meant to be cut into quarters but we are working with sourdough here so halves will have to do. 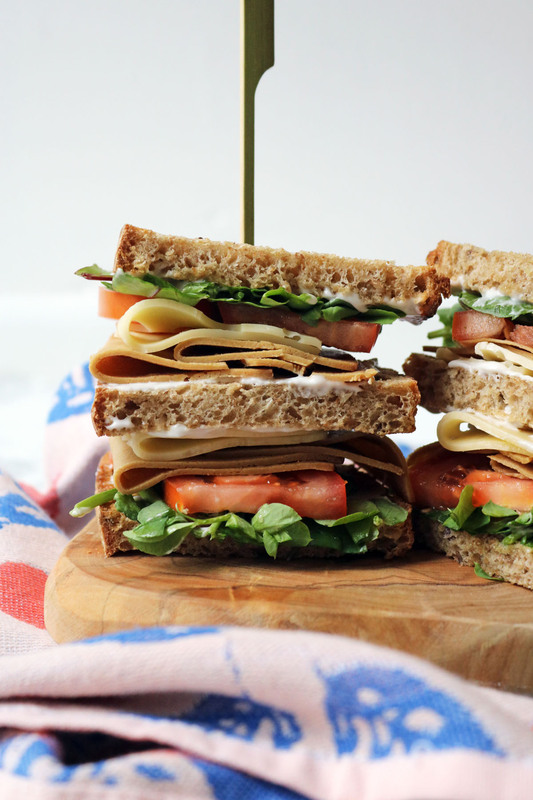 This Vegan Club Sandwich is the ultimate plant-based lunch! Toast all three slices of sourdough bread to your preferred level of crispiness. Take one slice of the toasted sourdough and spread with mayonnaise on just one side. Place half of the lettuce, followed by half of the tomatoes on top of the mayonnaise. Next layer 3 slices of tofurky followed by 2 slices of cheese. Take another slice of sourdough and spread both sides with mayonnaise before placing on top of the cheese. Add two more slices of cheese followed by the remaining tofurky, tomato slices and lettuce. Take the final slice of sourdough bread and spread with mayonnaise. Place on top of the sandwich and pierce from top to bottom with two bamboo skewers (one either side). Slice the sandwich in half and serve. I think we are stretching somewhat calling it cooking haha! It was delicious though. There are so many vegan substitutes now it’s hard to know which to pick! 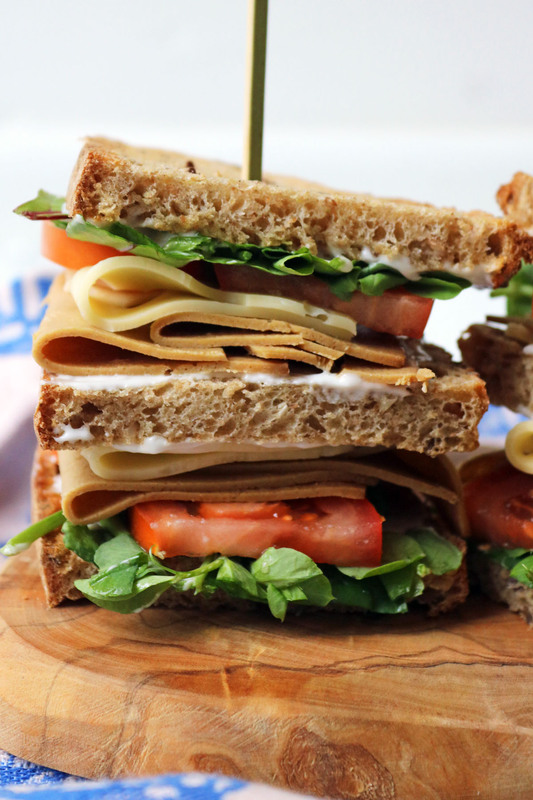 I’m trying to eat vegan in January – definitely going to be trying this vegan club sandwich. Looks amazing! This is so good! My vegan friends were so impressed with it – thank you for a delicious sandwich! There really are so many vegan substitutes these days, and the flavors have become so much better too. Looks great. It’s definitely a lot easier to make the transition these days! Looks like a delicious sandwich! My family will love this. What an awesome sandwich! Slap some avocados on there and I’m one happy camper. It looks great. I’ve never been keen on the thought of tofurky, but you’ve made it look good and altogether more appealing. Sharing!